Today’s recipe = easy and familiar. 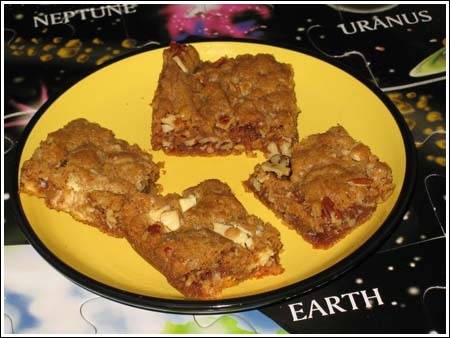 These brown sugar/blondie bars are chewy, rich and have lots of character. This variation is one based on an original from Country Woman magazine. I changed it a bit, but not much. The background should subconsciously relay that the cookies are out of this world. Preheat oven to 325 degrees F. Line an 8 inch square pan with foil and spray foil with cooking spray. Spread pecans on a half of a cookie sheet and toast for 5 minutes. Add coconut to cookie sheet with pecans and toast pecans and coconut together for another 5-6 minutes or until pecans are fragrant and coconut is brown around edges. Remove from heat and let cool. In a mixing bowl, beat egg and brown sugar with a mixer for 3 minutes. Add melted, cooled butter and vanilla; mix well. Combine flour, baking soda and salt; stir into brown sugar mixture. Chop up toasted pecans and stir pecans, coconut and white chocolate chunks into batter. Spread evenly in pan and bake at 325 for 30 minutes or until toothpick comes out with moist crumbs. Cool on wire rack. Cut into bars. I made these for an Inauguration Brunch yesterday. The flavor was amazing (I used cashews instead of pecans). Mine were really gooey and undercooked for some reason, and they seemed a lot thicker than yours (I used the same sized pan, not sure what happened). Anyway, because they were so delicious I am making them again and going to try putting them in a larger pan. Hopefully they will be more thoroughly cooked. You are right, the flavor is out of this world! Can I just say that I have been CRAVING blondies… I think I found one that I like finally… store made though! I must try these though… I wish I lived by you because I would come begging! Yum! These look good. I have just run out of my discount priced LARGE bag of white chips, so I have to go buy some…but these look great! I forgot all about the word “droll”. Good word. Thanks for FINALLY updating News You Can Eat with the cake batter ice cream. I was getting tired of looking at those cupcakes. New site looks fab! 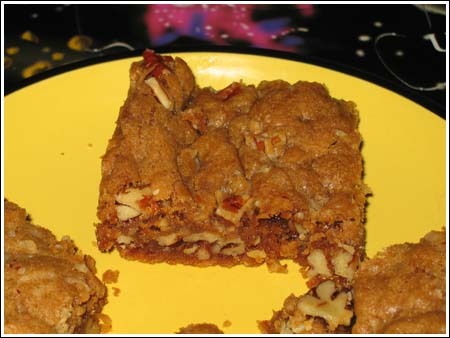 That’s exactly what I was thinking when I saw this recipe…coconut, pecans, butter….can’t go wrong”. Also, thanks for checking the blog every day. I’m a slave to it, but in a good way. It’s a good excuse for me to *have* to bake. What’s funny is that when we were spending over 100 pounds on dinners in London (about 200 American $), I consoled myself with the fact that in London, I wasn’t running to the grocery store every day buying ingredients for cookies. Let’s see….coconut, pecans, butter. Hmmmmmm, how could you go wrong with a combination like that? Can’t wait to try these! I really enjoyed your London pictures. Thanks for sharing! I am a diehard chocoholic, but sometimes I want something sweet that doesn’t contain chocolate. This would definitely do it for me! Thanks for sharing!